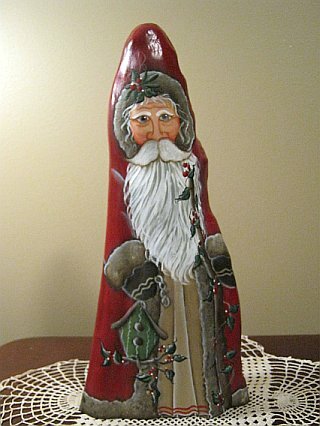 This 15" Santa has been painted on a cypress knee. His button-up robe is Christmas red with taupe fur trim. In one hand he holds a toy bag from which a teddy bear in peeking out. In the other, he holds a gingerbread cookie. 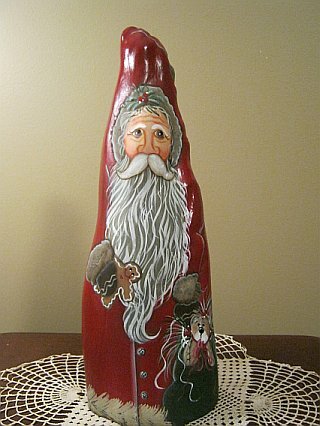 This 14" Santa has been painted on a cypress knee. His robe is Christmas red with taupe fur trim. The underskirt is beige with red accents. In one hand he holds a birdhouse. In the other, he carries a walking stick. 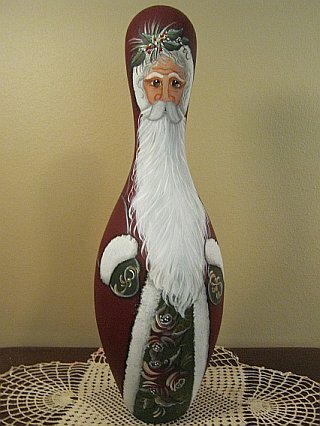 Santa has been painted on a vintage bowling pin. His burgundy coat is trimmed with white fur. The underskirt is pine green and accented with roses. 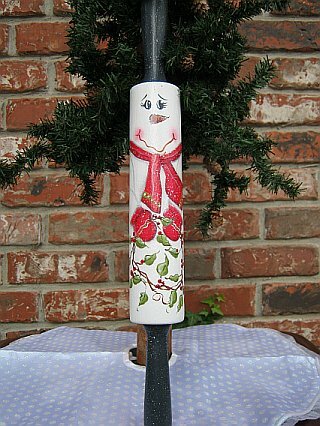 This snowman hand painted on a rolling pin. His scarf and mittens are red. He holds a grapevine wreath. Click on the photo to see another view. 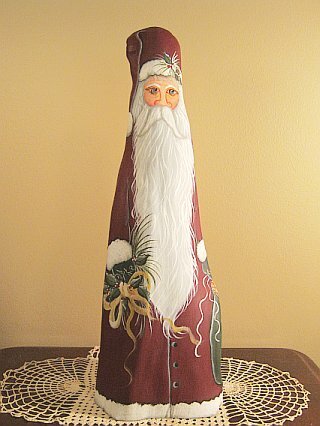 This Santa has been hand painted on a 18" cypress knee with a 6" base. His button-up robe is black cherry. He holds a handful of holiday greenery in one hand and a toy bag in the other. The pine green bag has been accented with roses and holds a teddy bear and rag doll. 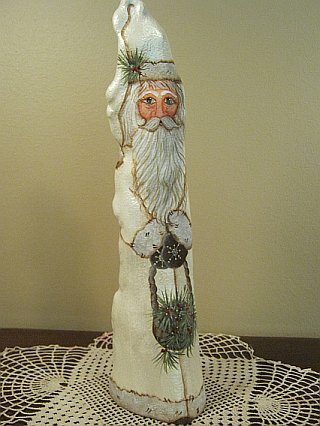 This petite cypress knee Santa is only 13" tall. His robe is painted pearilzed white. The trim is beige with white highlights. He holds a basket of holiday greenery. 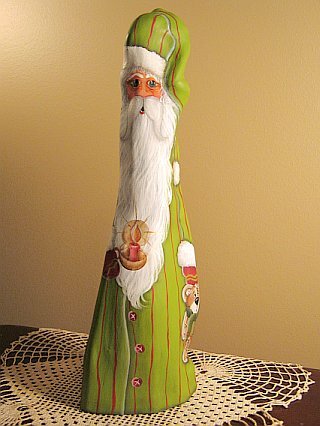 This sleepy Santa has been hand painted on a 13" cypress knee with a 4" base. His nightshirt is apple green with red stripes. With teddy bear and candle in hand, he is off to bed. 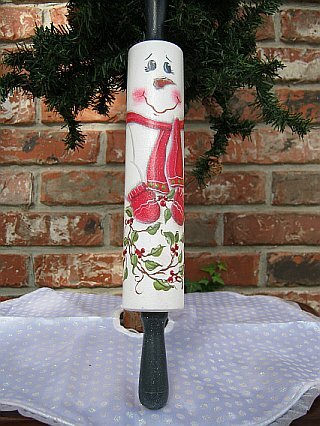 This snowgirl has been hand painted on a softball. 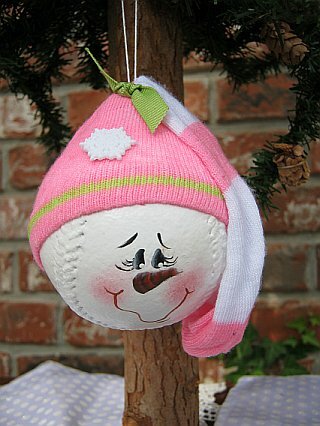 She wears a light pink and white knit cap accented with a snowflake. This is my unique take on the "snow globe". 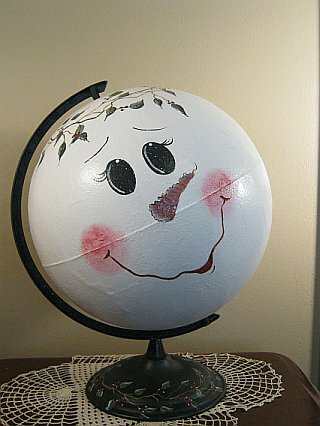 I painted an old globe as a snowman! Perfect addition to a snowman or snow globe collection. I occasionally have this available in a smaller size. Check with me for availability.